PRODUCT : COPIC SKETCH SET - 72 COLOURS - SET E. The Copic Sketch marker is the ideal tool for sketching and scribbling - perfect for designers, graphic artists and manga artists. The sketch has two standard tips: Medium Broad and Super Brush. It is particularly suitable for colouring drawings, photocopies and laser prints since the ink is alcohol-based and dries quickly. With the uncoloured blender, colour blends are created or colours are lightened. Packaged in a clear plastic case, a Sketch set is the ideal way to begin or add to a marker collection. This set contains the following colours. BG78, BG90, B0000, B66, B69, E0000, E17, E18, E23, E30, E42, E70, E81, E84, E87, E89, C00, W00, YR82, Y0000, Y000, Y18, YG0000, YG61, G0000, G000, G03, G43, G46, BG0000, BG000, BG53, BG57, BG70, BG72, BG75, RV91, RV93, RV95, RV99, R0000, R01, R21, R56, R81, R83, R85, R89, YR0000, YR01, YR12, YR15, YR27, YR30, BV0000, BV01, BV34, V0000, V000, V20, V22, V25, V28, V93, RV0000, RV000, RV00, RV52, RV55, RV63, RV66, RV69. 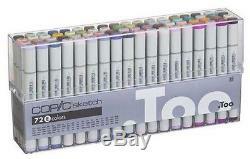 The item "Copic Sketch Marker Set 72 Pens Set E" is in sale since Monday, February 18, 2013. This item is in the category "Crafts\Art Supplies\Drawing & Lettering Supplies\Art Pens & Markers". The seller is "bargainartistshop" and is located in Stafford, Staffordshire. This item can be shipped worldwide.